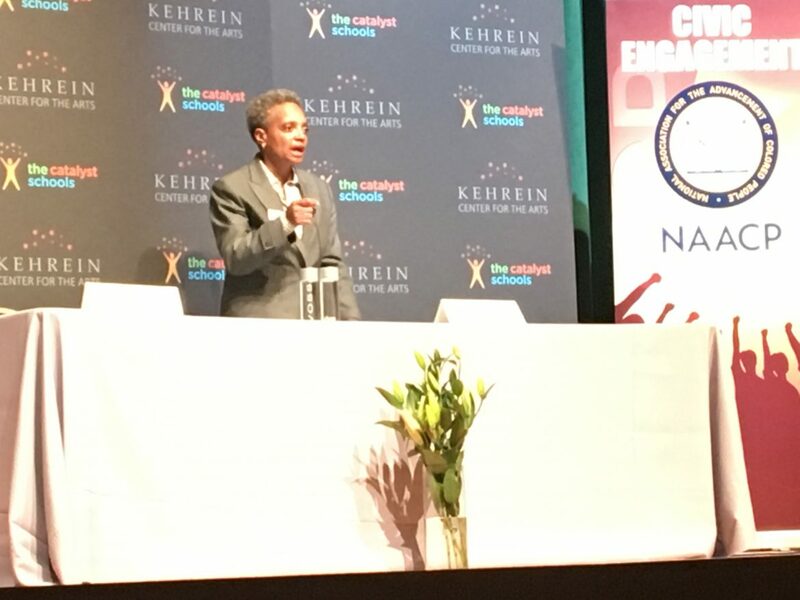 Mayoral candidate Lori Lightfoot addressed West Side residents who gathered March 28 at The Kehrein Center for the Arts, 5628 W. Washington Blvd., to hear her address a number of issues affecting the West Side. Opponent Toni Preckwinkle was a no show. Lori Lightfoot had the stage all to herself Thursday at the West Side mayoral forum when fellow candidate Toni Preckwinkle failed to show. Instead of getting a chance in the final days of the mayoral runoff to compare and contrast the views of both women, the few hundred West Side residents who attended the forum got to hear only from Lightfoot, a former federal prosecutor who garnered the most votes (17 percent) in the Feb. 26 election, with Preckwinkle coming in second (16 percent). Lightfoot wasted no time in promising her commitment to the West Side if elected April 2. “We can’t be a truly great city if our neighborhoods are starving. … I want to be a mayor who expands prosperity to all of our neighborhoods,” not just downtown, in the Loop and West Loop, and in parts of the North Side, she said. “Prosperity can’t stop at Ashland and Roosevelt,” Lightfoot added, eliciting loud applause from the audience gathered at the newly renovated, 1,000-seat theater at The Kehrein Center for the Arts, 5628 W. Washington Blvd. Lightfoot took questions from the audience via CBS2 Chicago reporter Dorothy Tucker and from a panel of West Side journalists and community advocates, touching on a number of topics from economic development and tax increment financing (TIFs) to policing and parking tickets. On West Side representation on various city boards: Lightfoot committed to adding more West Siders to governmental bodies including the Chicago Park District and Chicago Board of Education. On parking tickets: In the last seven years, 50,000 people have lost their cars because of violations, Lightfoot said. “That’s ridiculous” that people are going into bankruptcy because of parking tickets. “We need to do a top-to-bottom audit of ticketing practices and red light cameras. … If there really is a safety issue, that’s one thing. But if it’s purely for revenue, then we need to get rid of (red light cameras).” She noted that the city will then have to find other ways to replace the lost revenue. On economic development: More small businesses from the West Side and throughout the city need to be tapped to provide some of the $2 billion in goods and services the city of Chicago procures each year. Lightfoot noted Chicago has not had a citywide economic development plan in many years, possibly decades. And the absence of a land use plan means development is left up to private developers. On TIFs: Lightfoot wants a complete audit of every one of the city’s TIF districts to understand how they’ve been performing. She added there’s no need for downtown TIFs since they’re supposed to benefit blighted areas; “we all know that downtown is not blighted. … We’ve got to get back to basics with TIFs. There has to be more transparency,” and they should benefit economically struggling neighborhoods. On importance of small businesses: Small business activity is critically important to the health of the city, Lightfoot said, adding “the focus has to be on building wealth.” If the city focuses on West Side businesses who hire people from the West Side, that will improve the overall economy. Economic development can’t be dependent on national, big-box retailers coming into neighborhoods, she said. On respect police have for residents: The key to improving relations lies at the sergeant rank, Lightfoot said. “The culture lies at the sergeant level. … That is the way we’re going to advance and move the culture of the police department.” Another area not addressed in the consent decree, she said, is how sergeants are selected, how they are trained and how they’re held accountable. On the expired police contract now under negotiation with the city: The necessary changes needed in a new contract are very well known, Lightfoot said: Residents should be able to make anonymous complaints; they shouldn’t have to sign a sworn affidavit. And police disciplinary records should not be destroyed after five years, in violation of current state law, she said. In her closing remarks, Lightfoot, who’s worked more recently as a partner at the law firm Mayer Brown, vowed to help the West Side rise and thrive again. Last week’s forum was organized by the Chicago Westside branch of the NAACP and the Austin Quality of Life Plan’s Taskforce for Civic Engagement; AustinTalks and Austin Weekly News were the media partners. RSVP to the free event, which will be held at 6 p.m. Friday at Christ the King Jesuit College Preparatory School, 5088 W. Jackson Blvd.